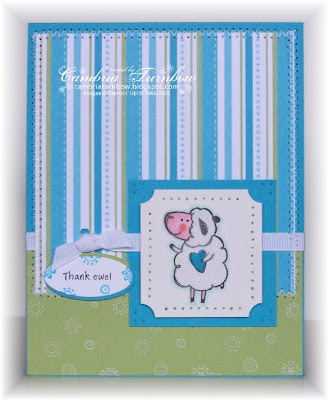 I love this little lamb from the new Spring Time Hanna set. I just got some white Fun Flock too, so I fleeced him up baby. I'm addicted to the Fun Flock, it's so much......... FUN! LOL. I also busted out my new Cuttlebug folders! Yeah me... challenge accomplished. Thanks Bethie! Paper: Ruby Red, Blush Blossom, Shimmery White, Chocolate Chip. 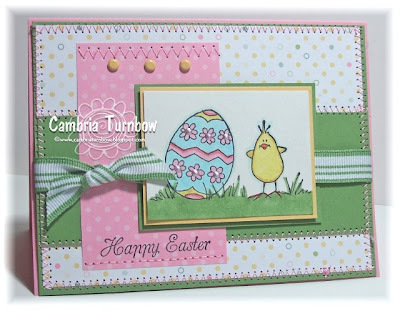 Other: Fun Flock, Quickie Glue Pen, Cuttlebug Embossing Folders (Swiss Dots, Floral Fantasy) Crafter's Tool Kit, Earth Element Brads, Chocolate Chip Poly-Twill Ribbon, Dimensionals Janome Sew Mini, Scor-Pal. If you want to come and play along with us, upload to SCS and put HSC6 in the keyword section, or you can post a link to your blog in my comment section. Have a super weekend everyone!! Man.... it's Friday? Where did this week go? I sure don't know... but I hope I can catch up this weekend! It's time for Beate's Weekend Sketch Challenge. Are you ready? Look at the CUTE stamp that my friend Asela sent me!!! OMG... I LOVE them!! Yes... 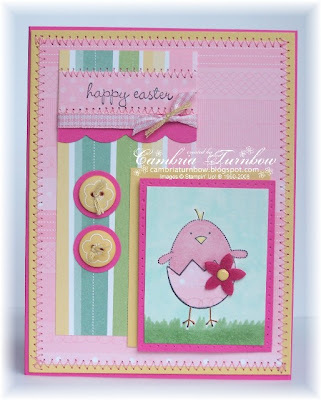 I have more cute Easter bunnies and chicks to show you! These are the first stamps I've had from Cornish Heritage Farms besides a background stamp, but I have to tell you these are NICE, QUALITY stamps... wow, am I impressed. These adorable stamps are DESIGNED by Asela herself!! If you haven't been over to Hop Art Studios to see my friend Asela, you are missing out. She is AMAZING. My mouth opens when I look at her art. GIRL CAN DRAW AND COLOR. Just don't go over to her blog, then to mine... LOL. I only WISH I could color like Asela! Paper: Pretty in Pink, Wild Wasabi, Shimmery White, So Saffron, Spring Fling Designer Paper. Other: Liquid Pearls Pastel Raspberry, Striped Wasabi Ribbon, So Saffron Brads, Crafter's Tool Kit, Dimensionals, Janome Sew Mini, Scor-Pal. Oh, am I ready for Spring... can you tell? I think my little Averie is feeling better. I wasn't so sure she'd make it to school this morning, but she did. Jayce and Baylor have their last basketball game on Saturday with pizza after! Oh, did I say I was going to get caught up this weekend? LOL... right. Have you seen the awesome recipes? I think I need to go and get a BIGGER crock pot! I can't wait to try them... even the "crock pot vomit" sounds good! Don't forget to leave a comment so you can have a chance to win on Sunday! Have a super weekend everyone!! Okay... last week of my Blogaversary month celebration. Once again, I want to thank you all so much for stopping in and visiting me. I wish I could everyone blog candy!! I LOVE LOVE LOVE the recipes... and there are some great ones, so if you want to keep leaving em, I'll take em. I think everyone loves them! Seriously, thanks to all of you who took the time to post a recipe and leave a comment. Kit creates 12 cards (6 ea. in 2 styles) Card size: 4-1/4" x 5-1/2"
Seriously... thanks SO much for making my first bloggin year so much fun!! Good luck!! No, I didn't forget about the last Wednesday BLOG CANDY give away!! :) I'm off to Eugene this morning. My son has an ortho appt and we have to drive two hours there, two back... good news is that I'm hopefully going to squeeze in a trip to Costco! I'll be back this evening to post the last Blogaversary Blog Candy. Thanks SO much for all the nice comments and recipes! I wish I could give everyone candy!! I had a workshop on Saturday..... have I told yah how much I love my girls? I do *wink* They are THE best! We have so much fun! I look forward to our meetings every month! This is one of the cards we made, but you are not going to believe what I did.... well, maybe you will. LOL. See the purty glitter? It was on my very first order along with this set Pun Fun from the new catalog. I even took the glitter to my workshop to show them how cool it is..... do you think I thought about actually PUTTING in on the little bird? No... it wasn't until this morning when it hit me... DUH... the colors match PERFECTLY! I'm such a dork... good thing my girls love me anyway. All the glitter in the Fine Cosmo Glitter colors will totally match the Flowers For You Designer paper PERFECTLY. So, if you get the paper, you HAVE to have the glitter. Oh, and I LOVE that glitter... it's my favorite. Just like Dazzling Diamonds but with COLOR baby. So... I had some workshop pieces left over and needed a thank you card, so I decided to use that cute lamb. I also had a container of white Fun Flock calling me. Dang, I dig that stuff. It's so much fun to add texture and you can't stop touching it! Then, of course I had to use the glitter too.... did I tell you that it's my favorite? 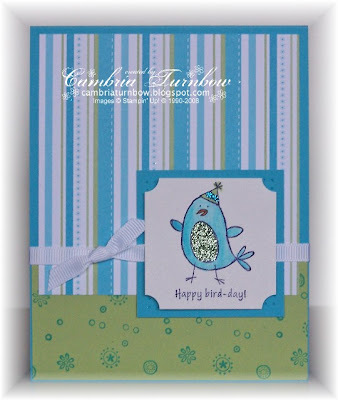 Paper: Flowers For You Designer Paper, Tempting Turquoise, Certainly Celery, Shimmery White. Ink: Basic Black, Pretty in Pink, Tempting Turquoise, Certainly Celery, Craft White. 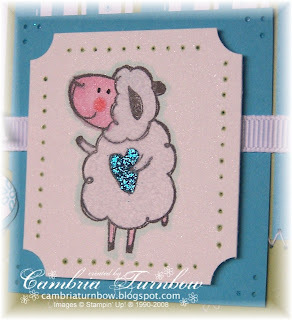 Other: Fun Flock (on the lamb), Fine Cosmo Glitter, Two Way Glue Pen, Crafter's Tool Kit, Slot Punch, Dimensionals, Photo Corner Punch, White Grosgrain, Janome Sew Mini, Scor-Pal. Okay.... Averie has been really sick all week and she just can't stop coughing, so we are off to see the Dr. today. I still have one more workshop project to show you, but I haven't got the tutorial done yet, so hopefully I'll have that tomorrow. Have a great day girls.... thanks for stopping by! 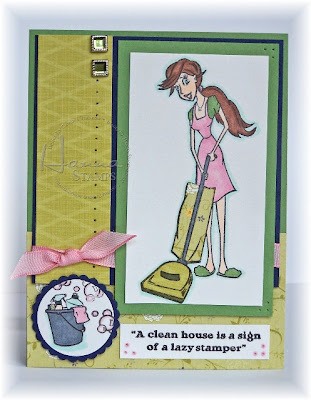 One more quick card for the Dirty Girl Shout Out challenge! This set designed by Melanie Muenchinger is just adorable! I was super lucky to get it when I was a guest designer for Gina K. Melanie is just amazing! You should see what she does with her sets.. she's da bomb for sure! Paper: Whisper White, Pretty in Pink, Chocolate Chip, Wild Wasabi. Ink: Palette Noir Black, Stampin'Write Markers, Copics, Wild Wasabi. Other: Heart Punch, Slit Punch, Liquid Pearls (heart on the rear) Dimensionals, Wasabi Striped Ribbon, Janome Sew Mini, Scor-Pal. Okay... back to the laundry. Just when I think I'm caught up...... there isn't such a thing as caught up is there? I need TWO washers and TWO dryers..... nah, that's just more work right? I wish I could twinkle my nose and SHAZAM, it's done and put away. I can dream..... LOL. Have a good day girls! Shoot me an email at CambriaTurnbow@charter.net Amy and the cup cakes are on the way to you!! Wow! Thanks everyone! You are all BOMBS! LOVE the recipes!!! I have one more Blogaversay give away next Wednesday and trust me, you don't want to miss it!! Okay... here is a recipe from me... well, really shared by my friend Lana, but it's a keeper and I'm for sure making it again. My teenager had thirds! 1. In slower cooker, combine the meat, soup, onion, Worcestershire sauce and water. 2. Cook on low for 8 hours, or on High setting for about 5 hours. Stir in cream cheese just before serving. Okay... I had my workshop this weekend with my hostess club girls..... highlight of my month. I met some new girls this time too... boy did we have fun. I'm working on a tutorial for them that I will share soon. Not feeling so hot today... I think I am catching A's bug so I'm taking it easy and taking my vitamins. Hope you all had a great weekend... thanks for stopping by!!! Here comes Peter Cotton Tail, hoppin' down the bunny trail.... it's been in my head all day. Please, someone get it out? 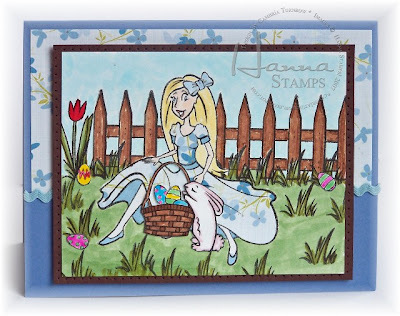 This cute bunny is from the new Hanna Set called Spring Time Hanna. I LOVE all the variety of stamps that comes with Hanna sets! The set has an adorable little lamb too. It's on sale today!! Paper: Pretty in Pink, Rose Red, Shimmery White, Heidi Grace, It's My Party. Other: Cindy Ribbon, Soft Subtle Brads, Dimensionals, Crafter's Tool Kit, Sakura Glitter Pen, Janome Sew Mini, Scor-Pal. Have a great day everyone, and a SUPER weekend! Thanks for stopping by!! Man......... don't be telling me in two months that you didn't take advantage and get this free SAB set while you could. It's Bombalicious baby! Talk about easy cards. I whipped this one up using the Special Delivery-Boy Scrapping kit and my punches. Easy Peasy. Paper: Soft Sky, Pumpkin Pie, Shimmery White, Special Delivery Boy Scrappin'Kit. Ink: Wild Wasabi, Pumpkin Pie. Other: Round Tab Punch, Circle Scallop Punch, Large Star Punch, Wasabi Stitched Ribbon, Dimensionals, Scor-Pal. Thanks SO much for the recipes! I can't wait to try them... you guys ROCK! I have some BBQ Beef left over in the fridge from a crock pot recipe one of you left last week, so I'm totally trying the one in this weeks comments! Have a great day everyone!! YESTERDAY was Wednesday Blog Candy.... DUH! Sorry about that.... I totally spaced it was Wednesday YESTERDAY... that Monday holiday threw me off big time! I LOVE this set...... it's AWESBOMB indeed. Look at the options for cupcakes. 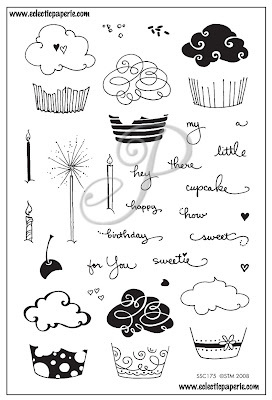 I've been swamped making swap cards, but I'll put together my cupcake cards this weekend. LOVE this set... hope you do too. Leave a comment, any comment. Of course recipes are ALWAYS appreciated. In fact, I've tried a few and SHAZAM, they are winners. I'll share those later next week, but you can check out the previous blog candy comments to get some GREAT recipes. Thanks so much for sharing girls!! Thanks too for helping me celebrate my one year Blogaversary! Challenge Focus: Stamps Designed by Fellow Dirty Girls. -OR- alternate option - use any fellow Dirty Girl's gallery creation as an inspiration to semi-CASE something of your own (be sure to link it in your post). Required Element: Spring Color Combo - whatever feels like Spring to you! 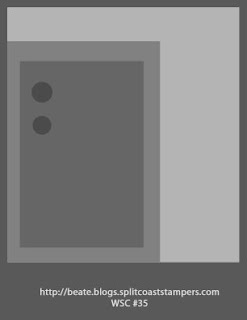 Restricted Element: NO CuttleBug/Big Shot/Wizard or similar diecut/embossing machines. So... I was lucky enough to get Melanie's cute set while being a guest designer for Gina K Designs, and was thrilled that I'd get a chance to use it! I also chose to make a reverse tent topper. 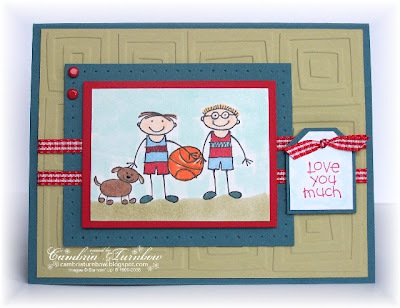 Melanie did an awesome tutorial on her blog on how to make these cute cards! 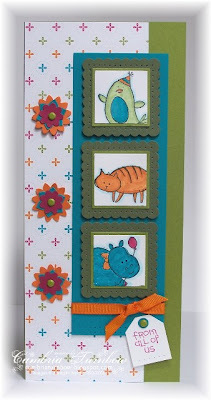 I also used Lisa's background stamp Scalloped Lace.... see the hippo? That is lace skin baby.... pink lace skin. :) LOVE that background!! 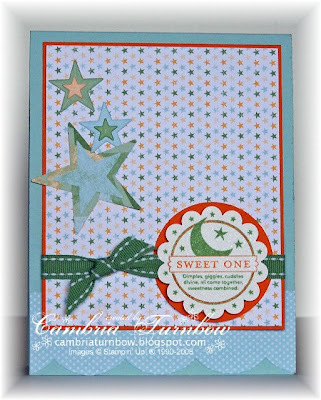 Stamps: Just So Hippy, Festive Labels (Gina K. Designs), Scalloped Lace Background (Cornish Heritage Farms). 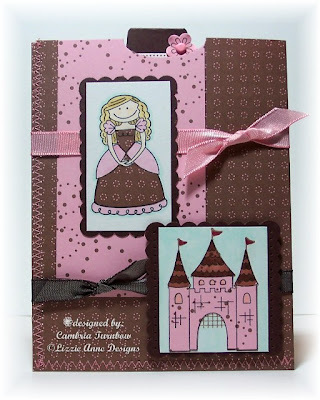 Paper: Basic Gray, Rose Romance and Wild Wasabi Textured card stock, Crew Kids-Girl Scrappin Kit, Shimmery White. Ink: Palette Noir Black, Pretty in Pink, Basic Gray. Other: Word Window Punch, Coluzzle, Corner Rounder Punch, Marvy Scallop Circle (pink), Sakura Glaze Pen, Uniball White Gel Pen, Tiny Flower Punch (Target), Stampendous Dot Stickers, Dimensionals, Taffeta Ribbon, Janome Sew Mini, Scor-pal. Thanks Jami for the Dirty Challenge... they are SO much fun. Have a great day everyone!! Thanks for stopping by! How cute is this chick? I LOVE this set! I bet you didn't think I would say that huh? Yes, it's a FAVORITE. *wink* And, the Spring Fling Designer paper is also on the top of my list. Wasabi and pink are my new favorites together. The egg is all glitterfied with Dazzling Diamonds.... isn't she cute? I think she is too cute. Paper: Wild Wasabi, Whisper White, Pretty in Pink, Spring Fling Designer Paper. Ink: Basic Black, So Saffron, Only Orange, Pretty in Pink. Craft Whisper White. Other: Scallop Punch, Circle Punches, Word Window Punch, Crafter's Tool Kit, Dimensionals, Pretty in Pink Brads, Dazzling Diamonds, Two-Way Glue Pen, Janome Sew Mini, Scor-pal. Tomorrow is Dirty Girl Challenge day, so I'm working on that today.... nothing like the last minute. Hope you all have a super day, and thanks for stopping by!! Hanna is ready for Easter.... her and her little friend. You are going to love this new set... it's full of all things spring. You can get this February 22nd! LOVE the bunnies and the eggs... there is even a cute little lamb! Hanna's dress is paper pieced with paper from Chatterbox called Sky Lilac. The under side and the cuffs are the opposite side of the paper. Her tights are colored with the white Glaze pen from Sakura. The rest of the coloring is done with my Copics. Paper: Ballet Blue, Whisper White, Chatterbox Sky Lilac, Chocolate Chip. Ink: Palette Noir Black, Copics, Sakura Glaze. Other: Crafter's Tool Kit, Blue Ric Rac, Dimensionals, Glitter Pen, Quickie Glue Pen. Love this new set from Lizzie Anne Designs! I know, I told you that already, but look at those wonderful flowers! 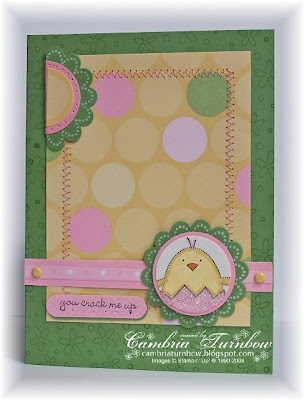 I used my Copic eSsentials from eP that coordinate with the Stampin'Up! In Colors. LOVE those markers. The Sentiment is from the set Simply Sentiments also by Lizzie Anne Designs. 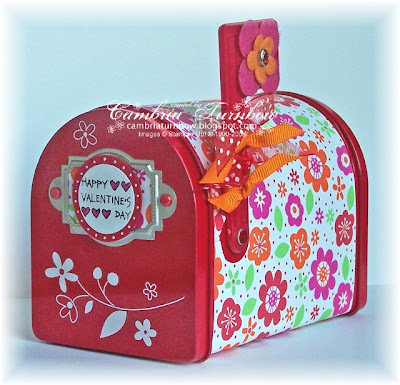 Stamps: Fun to be Floral, Simply Sentiments. Paper: Whisper White, Groovy Guava, Purely Pomegranate. Ink: Palette Noir Black, Cope eSsentials, Purely Pomegranate. Other: Marvy Scallop Punch, White Uniball Pen, Crafter's Tool kit, Stitched Ribbon, Vintage Brads, Janome Sew Mini, Scor-pal. Hope you all had a great weekend and that you find some time to stamp! I'm working on some swaps and laundry today and I have to run to the airport and pick up G-ma. She want to CA for the weekend. We missed her and are excited to have her back home. Thanks for stopping by! This is too good to be true!! Happy Valentine's Day!! I am in the same boat as you - cooking is challenging but I love to be crafty!! Congratulations!! Please email me at cambriaturnbow@charter.net and I'll send the candy your way!! Thanks again for all the AWESBOMB recipes!!! Oh man... I LOVE the Crew Kids-Girl Scrappin' Kit! LOVE IT! Here are a couple more little mailboxes I made with the scrappin kit and those Target mailboxes. 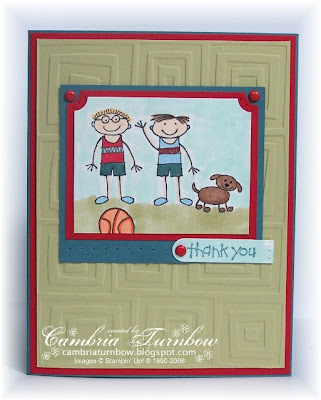 The Hodgepodge hardware is from the new Styled Silver Kit available in the Occasions Mini. I used the poker from the Crafter's Tool Kit to attach them to the lids with Pretty in Pink brads. I also added the striped ribbon to the other box after the photo (duh). And, look at those GREEN rub ons!! Get em for free baby during SAB! Couldn't be easier than this easy peasy project!! Okay... so I'm off to a basketball game and then a trip to Reedsport, but I'll be back to draw a winner for the blog candy! THANKS FOR THE RECIPES... I'm thrilled! I can't wait to try some out. You guys ROCK! Have a great Saturday everyone! Thanks for stopping by! 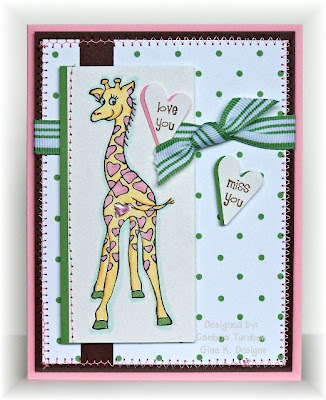 Paper: Wild Wasabi, Pretty in Pink, Basic Gray, Whisper White, Crew Kids-Girl and Spring Fling Designer Paper. 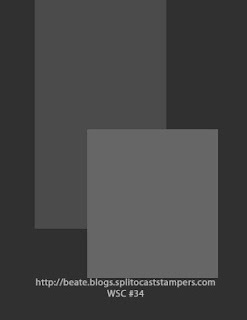 Ink: Basic Black, Wild Wasabi, Basic Gray, Craft Whisper White. Other: Dimensionals, Striped Ribbon, Large Oval Punch, Pretty in Pink Brads, Clippies (gift from a friend, not sure of the brand), Uniball White Gel Pen, Crafter's Tool Kit, Janome Sew Mini, Scor-Pal. 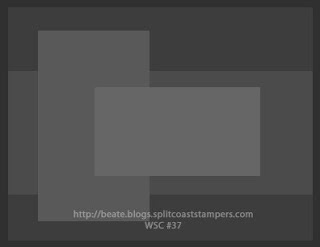 Don't forget to check out these awesbomb bloggers and include WSC35 in the keyword section when you upload your creation to the SCS gallery. Hope you all had a wonderful Valentine's Day! I got spoiled by my Valentine and had a wonderful day with the kids. THANKS for all the awesome recipes and don't forget to leave a comment (or better yet, a recipe) for your chance to win the blog candy! Thanks for stopping by! Blogaversary (love that term) Candy Week #2. I cannot believe I've had my blog for a year and I want to thank you for visiting and for your support!! I'll be giving away blog candy each week starting on Wednesday until the end of the month. Here is the candy up for grab this week! 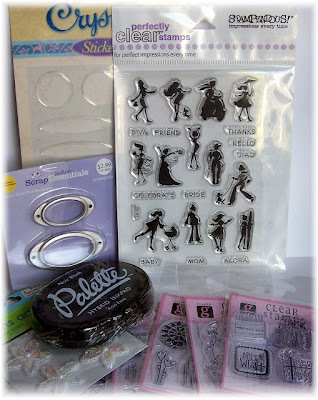 One Stampendous Sassy Sillhouettes Acrylic Stamp set, Crystal Stickers, Scrap Essentials Brushed Silver Oval Bookplates, Flower Adhesive Sequins, five Studio G Clear Stamp Sets, and One Palette Black Noir Stamp Pad!! I will draw on Saturday! All you have to do is leave a comment, any comment, but of course if you want to help out the cooking retarded (ME), I'd LOVE LOVE LOVE your easy recipes for dinner!! And, a BIG THANK YOU for those of you who shared recipes on the first blog candy post. Have a super day and thanks always for stopping by to visit me!!! Ever have one of those days when you have something in mind and it just won't work the way you intended? Well, that was the other day for me. I masked that heart and stamped the kids like three times! See the corner? That's covering up a smudge, but I was NOT going to do it again! LOL. Of course, I was trying to beat the mailman so that didn't help either. Anyway, not super pleased with how this one turned out, but it's done and on it's way to the grandparents. 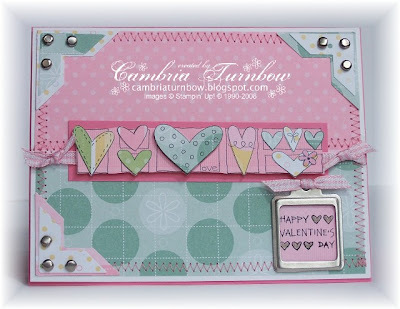 The heart image is from a new set in the Occasions Mini called Just Celebrate, and it's available March 1st. The Hodgepodge is also from the new Styled Silver Hodgepodge kit. Oh, man, that mini is going to break me. I want it all!!! 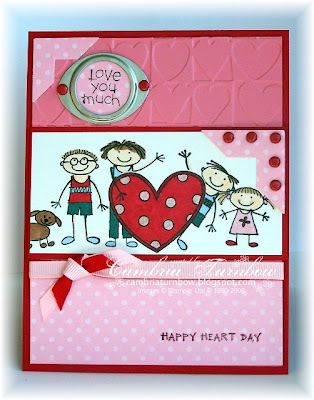 Stamps: Just Celebrate, All in the Family, Family Phrases, Happy Heart Day. Paper: Spring Fling Designer Paper, Real Red, Regal Rose, Shimmery White. Ink: Palette Noir Black, Copics. Other: Cuttlebug, Hearts Embossing Folder, Styled Silver Hodgepodge Kit, Real Red Brads, Photo Corner Punch, Circle Punch, Grosgrain ribbon, Dazzling Diamonds Glitter. Okay... one more thing to show you. Of course the 14th snuck up on me.... like always. My sweet friend Bev sent me these adorable mailboxes last year... or maybe the year before (mommy brains) because I am Target deprived. 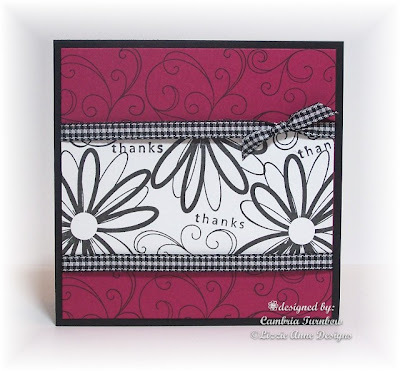 I used some retired Stampin' Up designer paper, the new Styled Silver Hodgepodge and the Flower Fusion flowers to jazz it up. Oh, and the rub ons that you can get for FREE right now during SAB. :) Have I told you how much I LOVE LOVE LOVE the new Rub Ons? *wink* I used the Crop-a-dile to make the hole for the mail flag.... easy peasy. For the lid, I just used the poker from the Crafter's Tool Kit to make the holes for the brads to hold the hodgepodge piece. I'm going to get some more done today. I will fill them with candy for teachers. Okay.. back in a few for more Blogaversary BLOG CANDY!!! Have a great day everyone!! Sometimes, it's the easiest cards that are my favorites. This one was indeed easy, but I love it. It's the new awesome flowers from Lizzie Anne Designs called Fun to be Floral. The swirls are also from Lizzie Anne Designs in the set called In The Background. No extra postage on this one, but it gets the job done baby. Stamps: Fun To Be Floral, In The Background. Paper: Purely Pomegranate, Whisper White, Basic Black. I'm off to hit the grocery store to get some ingredients for some of the yummy recipes you shared with me. Thanks again!! And.... I need to get Valentines ready. I know, I know... I should have started LAST week. Story of my life. SNORT! Have a great day everyone!! Thanks for stopping by! 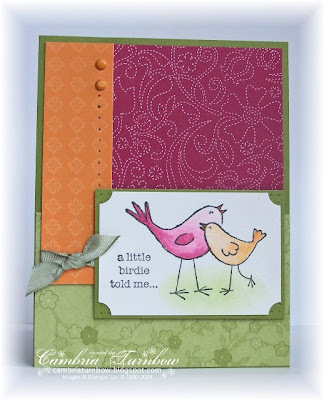 The Featured Stamper over at SCS this week is Sarah Green, who just happens to be in my downline and daughter of my friend Kim. They are both AMAZING stampers! I was so happy to find some time to play and to browse Sarah's amazing gallery! This card is CASE'd from this card. 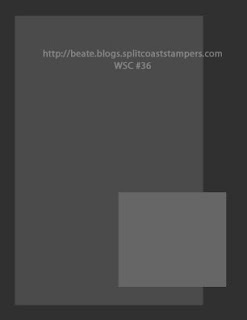 You can check out more about the Featured Stampers over at SCS in this forum. This is the set A Little Bit of Happiness, which is a level one hostess set. I paper pieced the hearts from scraps that I had from the Spring Fling Designer paper. The big heart in the middle is raised up with dimensionals. 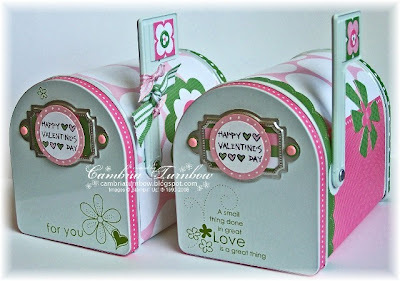 Stamps: A Little Bit of Happiness, Happy Heart Day. Paper: Spring Fling Designer Paper, Regal Rose, Whisper White. Ink: Basic Black, Mellow Moss Marker. Other: Photo Corner Punch, Hodgepodge Hardware, Gingham Ribbon, Crafter's Tool Kit, Dimensionals, Janome Sew Mini, Scor-Pal. Have a great day... thanks for stopping by! Birthday Whimsy is free baby! There isn't much that's better than free rubbah! This is a Sale-a-bration set that you can get totally for free with any $50.00 purchase from Stampin'Up! See more information here. 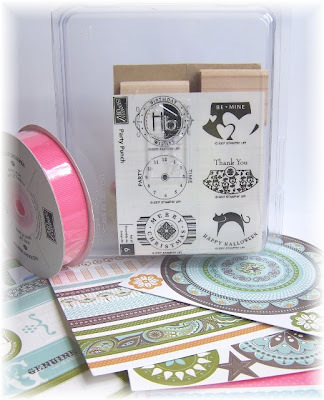 Stamps: Birthday Whimsy, Whimsy Jumbo Wheel. Paper: Wild Wasabi, Spring Fling Designer Paper, Regal Rose, Whisper White. Other: Word Window Punch, Crafter's Tool Kit, Soft Subtle Brads, Photo Corner Punch, Dimensionals, Jumbo Roller, Pink Gingham Ribbon, Scor-pal. Have a great Sunday everyone.... I am catching up on laundry today. Well, I doubt I'm going to ever catch up, but I'm trying. :) Thanks for stopping by! Blogaversary Candy Winner Week One!! Congratulations Jackie!! Contact me at Cambriaturnbow@charter.net with your address and the blog candy is on the way! Thanks again for celebrating my first year bloggin with me!! I'll post more blog candy on Wednesday!! I guess posting what number you are didn't work. I counted twice (thank goodness it was a low number!). Good luck next week!!! Wow... my Saturday got away from me... the boys won their game and Bay made the winning basket! SO exciting. Ink: Craft White, Pure Color Pencils, Copic eSsentials. Other: White Taffeta, Dimensionals, Scor-pal. Hope you are all having a great Saturday! Tomorrow I draw for the blog candy!! Thanks again for all the sweet comments and the recipes!! E for EXECELLENT baby! Wow, thanks Broni!! Check out her excellent blog over at Splashes of Watercolor!! How sweet! So.... I'm suppose to list 10 other excellent blogs. Now, how do I do that? There are SO many!! I'll try to list some EXCELLENT blogs you may have missed or some that haven't already been awarded. Here we go! Okay... so that was really hard. There are TONS of excellent bloggers. I'm off to a basketball game, but I'll post a card later today. Have a great weekend everyone!! TGIF baby! Time for Beate's Weekend Sketch Challenge! Whooo hoooo! And... I got this one right. I double checked! This IS the right sketch! Everything is Stampin'Up! except for the DMC thread through the buttons and tied in the ribbon. Did you look at the buttons close? See the flowers? Oh yah baby..... YES THEY ARE. Rub ons indeed. Dang, I love Rub ons! Paper: Spring Fling Designer Paper, Pink Passion, Barely Banana, Shimmery White. Ink: Basic Black, Stampin Write Markers, Copics. Other: Fresh Favorites II Buttons, Circle Punch, Colored Brads, Dimensionals, Gingham Ribbon, Corner Rounder, Crafter's Tool Kit, Eastern Elegance Rub Ons, Flower Fusion (LOVE THESE). Okay... you know the drill.... go and check out what the other cool chicks did this week... get it... cool chicks? I'm going to get my coffee.... I think I need coffee. LOL. Have a great weekend everyone... don't forget to enter for the blog candy drawing!! Thanks for stopping by!! This layout was inspired by a sketch over at CPS. Cool site if you haven't already checked it out. They have sketches.... very cool sketches. Paper is from my Basic Grey Mellow Pad. I love this pad! It's 6x6 and is full of the whole mellow line of paper. The stones in the center of the flowers are Rhinestone brads from Stampin'Up!. 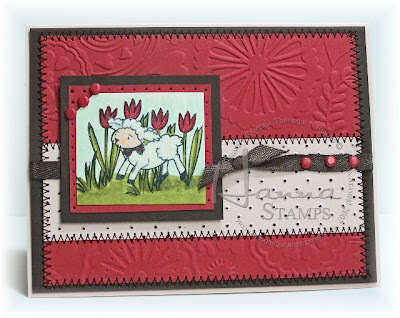 Stamps: Funky Floral (Lizzie Anne Designs). Paper: Mellow Pad (Basic Grey), Chocolate Chip, Very Vanilla, Mellow Moss, Ruby Red. Ink: Ruby Red, Handsome Hunter, Chocolate Chip. Other: Jumbo Eyelets, Rhinestone Brads, Circle Punch, Marvy Rectangle Scallop Punch (purple), Crafter's Tool Kit, Dimensionals, Janome Sew Mini, Scor-pal. There is still time to enter for the candy!! So... what's for dinner baby????? Have a good day everyone! I'm off to run some errands. I played too many games of Wii bowling this morning with my husband and now I have to hurry before the bus brings Averie home! But hey... I won! And, now I have a pretty sparkly pink ball! How bad is that? We get the kids off to school and then sneak in some bowling in on their Wii. 1 Yr. Celebration and Blog Candy!! Whooo Hoooo... so it's been one year! I can't believe I'm an official "blogger". I'm going to give out blog candy all month long... once a week until the end of the month. Leave a comment, any comment..... of course if you can't think of anything, you can share your favorite easy family recipe for dinner! LOL. Please put what number your comment is... it makes it a little easier to find who won when I put you all in to random.org. I'll draw on Sunday! 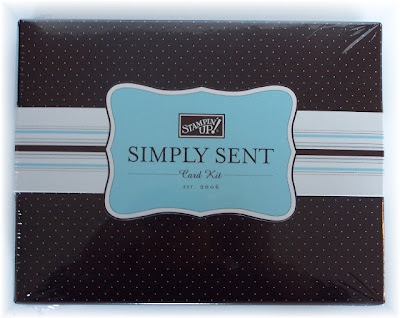 Candy includes one Party Punch stamp set, One roll of Regal Rose Ribbon, and 12 assorted sheets from Accent and Element kits (with a tin). I want to thank you all from the bottom of my heart for making my first year so much fun! Your comments truly make my days. I feel so lucky to have so many "friends" out there. It's been fun getting to know some of you. Your support and friendship means the world to me! I'm having so much fun with this set! My twins just had their 11th birthday last month. Today they are home from school (teacher training of some kind) and we need to get some thank you cards out. I also had a couple friends who went above and beyond to make my guys feel special after the dog attack. We are on a mission. 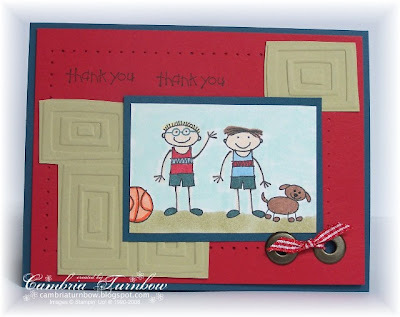 I used my Cuttlebug and this embossing folder. I used the stamp sets All In The Family, Family Phrases and Family Accessories. I used the card stock Real Red, Shimmery White, Blue Bayou, and River Rock. I used the Copic eSsentials and a couple other Copics for the coloring. Everything else was from my Stampin'Up! stash.... my Crafter's Tool Kit, Word Window Punch, Real Red Brads, Jumbo Eyelets, Tag Corner Punch, Stamp-a-majig, Gingham ribbon and my dimensionals. Can you believe I've been a blogger for a whole year now? I would have never started if it weren't for a little push from my friend Bethie... who whipped me up my banner and got things started. Thanks Bethie... it's been so much fun!! Okay.... I'm off to get the boys started writing their notes, then I'm posting some blog candy for the rest of the week!! See ya in a minute! 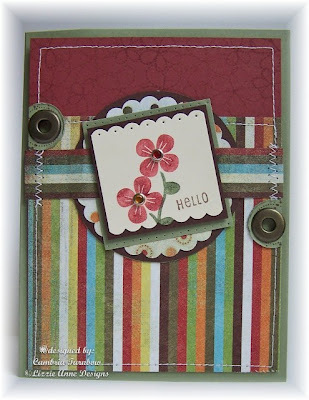 The background is the new Twill background stamp stamped with Craft White. I like how it turned out. 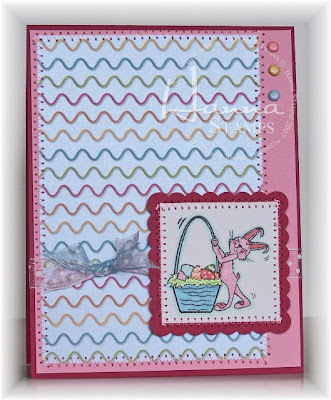 The hearts are made with a Cuttlebug embossing folder. Speaking of which, eP has all the new embossing folders in their store now! I ordered a couple yesterday and can't wait to get them! I've been neglecting my bug. Paper: Blue Bayou, Buckaroo Blue, Shimmery White, Real Red. Other: Word Window Punch, Dimensionals, Large Brass Eyelets, Cindy Ribbon, Crop-a-dile, Real Red Brads, Scor-Pal. Hope you all have a great day and stay warm! Thanks for stopping by! Oh, that Hanna... what doesn't she do? I wish I looked that good with a vacuum cleaner! Have you seen the new set, Domestic Goddess? It's way cool... love all the accessories Hanna sets include. I am NOT a lazy stamper... that's all I have to say. SNORT! 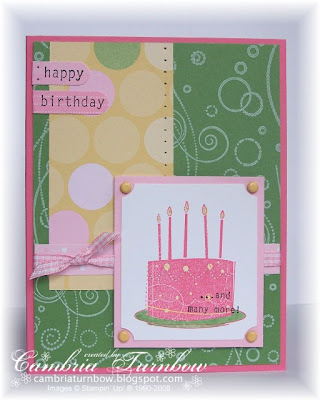 The designer paper is from Chatterbox called Olive Parlor Roses. It's double sided so I used both sides for the vacuum cleaner. Paper piecing is SO much fun I can't resist on the Hanna sets. Ink: Palette Noir Black, Copic Markers. Paper: Night of Navy, Shimmery White, Wild Wasabi, Chatter Box. Other: Crafter's Tool Kit, Marvy Scallop Punch (yellow), Taffeta Ribbon, Sakura Glitter Pen, Square Rhinestone Brads, Dimensionals, Scor-pal. Not feeling so hot today, sorry for the short post.... maybe it was the junk food yesterday. LOL. My one year blog anniversary is coming up this week. I can hardly believe I've been a blogger for a year now. I think I'll have to do some blog candy for sure! Have a super day everyone!! I've got to get some stuff out in the mail... I'm on a mission today. Happy Stampin' Day..... er... I mean Superbowl Day! Kids are fed, dip is done, kitchen is clean.... it's stampin' time baby. 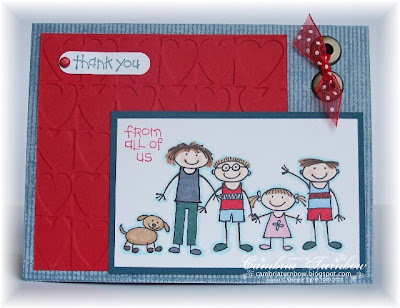 I LOVE this cute set in the new Stampin'Up! Catalog! I finally had some time to ink it up. I have to admit, I was inspired again by Danielle at Fat Cat Stamper. Girl is TALENTED! I love how she made the little birdie whispering in the ear of the big bird. To do this, just stamp the little birdie on your image, then stamp it again onto a post it note and cut it out. Lay it over the first bird and then stamp the big bird right over the top. Remove your mask and shazam... whispering birdie. :) Thanks Danielle for sharing your awesome ideas. Ink: Basic Black, Purely Pomegranate, Pumpkin Pie, White Craft. Paper: Old Olive, Shimmery White, Bali Breeze Designer Paper, Purely Pomegranate. Other: Crafter's Tool Kit, EE Brads, Moss Tafetta Ribbon, Large Oval Punch, Stampin Pastels, Dimensionals, Blender Pen, Scor-Pal. Hope you are having a fun day! I'm off to do some more stampin while everyone is full. :) Thanks for stopping by! Isn't she cute? I love this sweet little princess. I am digging this new set from Lizzie Anne Designs. 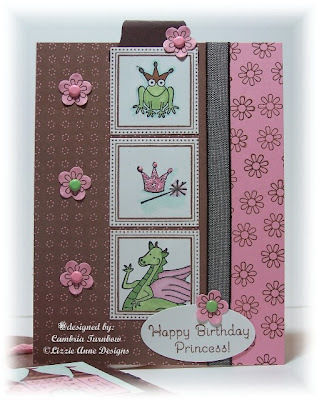 The frog and the dragon are SO cute... and can be used for boy cards too. I just want to pinch that princesse's cheeks! This is a pocket cards of such. The inside is design is based on Beate's Weekend Sketch Challenge #33. This is what I did for the pocket part. I cut Berry Bliss Designer paper 12 x 5.5, I scored at 4 1/4 then again at 8.5, then I left about 1/4 inch and cut the rest off (and used it for the front and inside. I then folded it up and sewed along the edge and the bottom. The inside pull out part is cut at 5 x 3 7/8. I covered the back of the pull out with a white scalloped piece of card stock from Stampendous, but you could use any card stock.... I figure that is where I can write my little note and it covers up the other side of the ribbon. 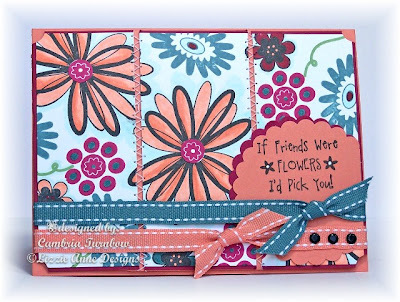 The flowers on the side are stamped with chocolate chip ink with flowers from the set In the Background (Lizzie Anne). The frames are from the set Celebration Frames and punched out with my large square punch from Stampin'Up!. The crown is covered with Cotton Candy Stickles. Stamps: Once Upon a Time, Celebration Frames, In the Background (Lizzie Anne Desgins). Ink: Palette Noir Black, Chocolate Chip, Copic Markers. Other: Large Oval Punch, Three for You Flower Punch, Small Oval Punch (opening in the pocket), Round Tab Punch, Large Square Punch, (all from SU!) Marvy Rectangle Punch, Square Marvy Punch (Punched out and sent from my friend Beate.. thanks babe). Pretty in Pink and Celery Brads, Taffeta Ribbon, Crafter's Tool Kit, Dimensionals, Scalloped Post Cards (Stampendous), Cotton Candy Stickles, Sakura Glitter Pen, Janome Sew Mini, Scor-pal. 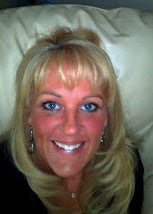 Hope you all have a super weekend... speaking of super, are you watching the Super Bowl or stampin? I get to stamp in the family room... where the big screen is. So, although I don't really watch the football game, I love hanging out with my boys and being in the excitement. They are SO psyched (my husband is a sport nut), so I'm excited for them. And, I am looking forward to some yummy chip dip and munchies. :) Thanks for stopping by!! TGIF baby! Happy Super Bowl Weekend! I hope you get some stampin time in during that football game. *wink* Time for Beate's Sketch Challenge!!! This one was fun! Other: Square Punches, Boho Blossoms Punch, Circle Punch, Crafter's Tool Kit, Dimensionals, Old Olive Brads, Tag Corner Punch, Scor-Pal. I'm off to do some Super Bowl munchie shopping. The boys can't wait for Sunday! Hope you all have a super weekend!! Thanks for stopping by!! Don't forget to upload your challenge card at SCS and include the keyworkd WSC33!